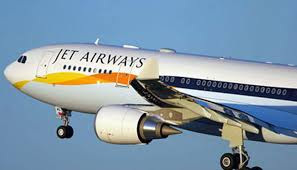 India's biggest full-service carrier Jet Airways Ltd has told its pilots the airline may be grounded in 60 days unless cost-cutting measures including pay cuts are put in place, a senior company executive told Reuters on Friday. The company was looking at sales and distribution, payroll, maintenance and other areas for savings to create a "healthier and a more resilient business", a company spokesman said in a statement. "There are some job losses across verticals but not among pilots," the source added, declining to be named as the talks with staff were private. Surging fuel prices and a weaker rupee are hurting Indian airlines, with the country's leading carrier IndiGo reporting a 97 percent plunge in profit on Monday. The company, part owned by Etihad Airways, had net debt of 81.5 billion rupees ($1.2 billion) as of end-March with the bulk of it being U.S. dollar denominated.